← Just over three weeks to go! We are pleased to announce an extra concert has been added to our autumn programme of events. 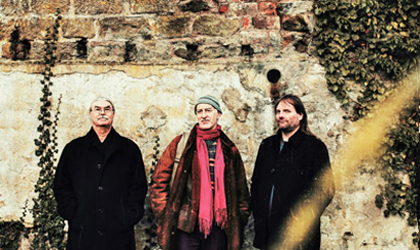 The name Peter Knight will be familiar with lovers of folk music and on Thursday, 5th November his trio Gigspanner will be performing a full set at Kettering Arts Centre. The world is fond of labelling everything, putting everything into neat little boxes, but the music of Gigspanner has yet to be categorised. It is not folk, it is not rock, it is not pop, classical or whatever other genre you care to think of, the only description available is the one word which the trio themselves have coined – GIGSPANNER. At the end of 2013 the classically trained fiddle player Peter Knight, left the pioneering folk-rock band, Steeleye Span, after being with them for almost 42 years. He had been literally instrumental in helping to create the sound that distinctly set the band apart from any other. In recent years, whilst still in the band, he started a new project and together with Roger Flack (guitar) and Vincent Salfass (congas, djembe) formed Gigspanner, and with them, a new musical concept. While Peter’s founding in traditional British music is still fundamentally at the core the new format allows him to explore different avenues. The trio incorporate elements of Cajun, African, Aboriginal and Eastern European music into the tunes which led the late author, Terry Pratchett, to write: “Peter Knight can spin the world on his bow” and Folkcast writer Phil Widdows commented that audiences are transported on a “blistering pace of a musical world tour”. The debut album released November 2008, called Lipreading The Poet, was named by The Wire magazine as one of the best 15 ‘Global’ Albums of 2009. Please visit our dedicated event page for further details here. This entry was posted in Live Music, Music and tagged Gigspanner. Bookmark the permalink.